Tepic, "The City of Eternal Spring," is the capital of Nayarit State, Mexico, and lies at the crossroads of highways 15 and 200 that transport sun worshippers to the coastal paradises of west Mexico: Mazatlan and Puerto Vallarta. Most travelers pass this little gem of a colonial city, unknowingly missing out on the attractive Spanish cathedrals, museums and vibrant artist cooperatives in and around town. 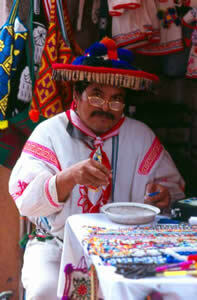 Tepic is also home to many Huichol Indians. Clad in plumed sombreros and colorful embroidered clothing, they are world famous for their peyote-inspired arts, yarn paintings, beaded objects and funky, fluorescent textiles. Peyote (híkuri), a cactus that grows far away in the land of their mythical origins, is the "sacred assistant" used by the Huichol to communicate with their gods and ancestors and to find inspiration for their visual and hallucinatory arts. 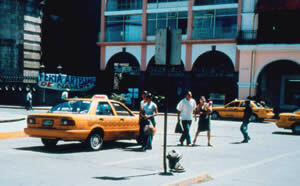 Peyote leads all on their "path to knowledge," and this imagery is seen everywhere in Tepic, including abstract renderings of the flowering cactus on taxicabs. 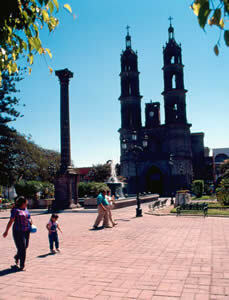 Because of Tepic's reputation as a hotbed for Indian arts and crafts, many Mexican artisans, including painters, sculptors and writers have moved here. More importantly, one of Tepic's native sons, Vladimir Smith, has recently returned from the glamour of Puerto Vallarta to run the first and only tattoo studio in the city, Tattoo Studio 59. Vladimir returned to Tepic in 2000, after working for two years as a tattoo artist at 69 Tattoo in Puerto Vallarta ("P.V."). Tired of the commercial tattoo culture of P.V., Señor Smith came home to open Studio 59, a significant number in that it represents the address of his parent's home, Avenida Independencia 59 Sur, where Smith has his fondest memories. He is the only tattoo artist in Tepic and strives "to make tattoo a respected artform," although the predominately Roman Catholic majority looks down on "mutilating the body." Smith's studio is located in a Huichol center for traditional arts called Plaza Puebla. It is situated on the sun-drenched third floor atop this cooperative where Huichol artisans sell their wares. A magnificent view of the old town and Sierra Huicholes greets the intrepid visitor. You can always find Smith, since his studio seconds as an apartment. Many clients come for tattoos of marine life (Pacific Ocean only 45 minutes away). Tribal tattoos, mainly of Precolumbian origin (Aztec calendars, Olmec heads, Maya alphabet), are eagerly sought after, but many of the interested clients cannot always afford them. 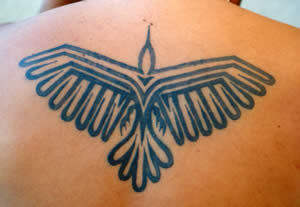 Thus, locals often request small tattoos of a Huichol woman or man placed on their shoulder. 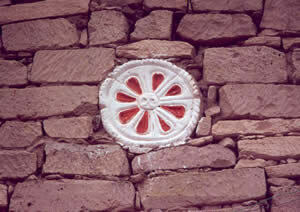 This is a regional symbol, and says, "I am proud to be from Tepic." 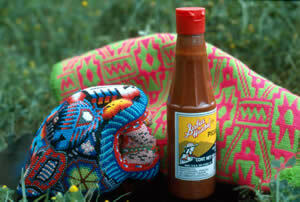 Of course, Salsa Huichol, the Tabasco sauce of west Mexico, features a similar design on its label, and you can't find a restaurant table here or in Guadalajara without a bottle or two. Smith also tattoos cosmetic modifications like lip liner and eyebrow enhancements, which are quite popular throughout Mexico. He doubles as an aromatherapist and piercer, but his clients are generally conservative. When I asked Smith what he thought about tattoo culture in Mexico, he offered, "Mexican tattoo artists have their own style which reflects the idiosyncrasies of their culture. They certainly do not follow tattoo trends in Europe or North America as much as one might expect," although the trends set forth in the largest tattoo magazine in Mexico, Tatuajes y Perforaciones, are generally noted. Some of the symbolism in Smith's flash relates to nationalist symbols like the serpent and eagle, which were borrowed from indigenous groups. 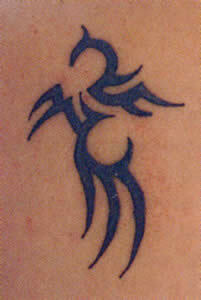 Birds always figure prominently in these tattoo designs. According to legend, the gods had advised the Aztecs that the place where they should establish their capital city was to be identified when they saw an eagle perched on a prickly pear tree, devouring a serpent. Today, this emblem is centered on the Mexican flag. The Huichol, who many scholars think are descended from the Aztecs, revere those birds that soar the highest, like eagles and hawks, because they see and hear everything, and are believed to possess mystical powers. Huichol shamans (mara'akames) use their feathers like radio antennas to receive communications from the gods in order to help them perform magical feats such as curing the sick, transforming the dead or calling down the sun. Smith tattoos 50% freehand and 50% via stencils. He has no apprentices and purchases supplies from the U.S. and Guadalajara, Mexico's second largest city in neighboring Jalisco State. Smith has volumes of flash art, but many of his clients bring in their own designs that they usually do not want duplicated or reproduced. Individuality, like most places in the world, is highly valued in this corner of Mexico; however, tattooing is negatively stereotyped in many parts of Central America and continues to be associated with alcoholism, drugs and gangs. In Honduras, El Salvador, and Guatemala tattooed youths are oftentimes singled out on the street, arrested and sent to jail. 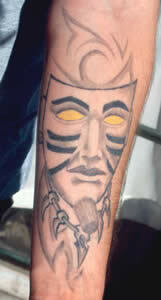 Smith wants to alter these stereotypes and to present tattoo as a "true" artform like painting, sculpture, etc. Smith will not tattoo gang symbols, and he lives for the art. It is his "expressive and spiritual device." More practically, given the high unemployment rate in Tepic, tattooing affords him professional flexibility, comparatively high wages and allows him to maintain close ties to friends and family living in the area. Vladimir's passion for the art also encompasses other projects with local artists like Saúl Tortolero who is an awesome figurative and abstract painter. 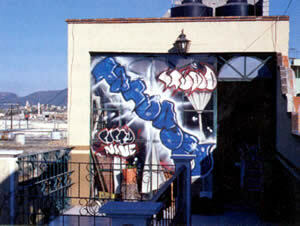 You definitely have to check out his studio in Tepic. Just ask Vladimir and he'll point you in the right direction. Spanish Cathedral, 18th century, Plaza de Tepic. 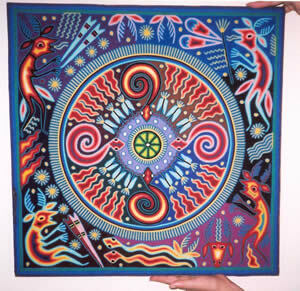 Huichol yarn painting with peyote symbol in center. The design comes from the dreams of a shaman and the yarn is placed on a thin layer of beeswax. Traditional yarn paintings are much smaller and are created to convey prayers to the deities or to create an amulet for the owner. Large paintings such as this one are produced for the tourist market. 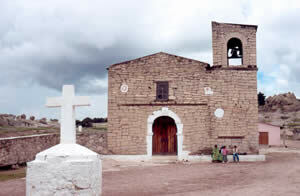 I could find no mission churches in the Huichol area decorated with peyote designs, but the façade of the 18th century Jesuit mission church in the Rarámuri (Tarahumara) community of San Ignacio, Chihuahua is adorned with a peyote motif. Although the Huichol were never known to tattoo themselves, the 18th century Rarámuri, who are linguistic relatives of the Huichol to the north, pricked dotted wavy lines of charcoal upon the foreheads and lips of little girls as well as round "wheels" upon both cheeks. 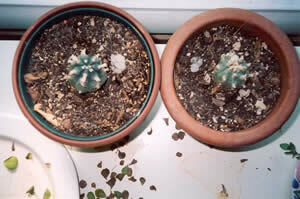 Today, in both the Huichol and Rarámuri languages, the word for peyote is híkuri and some Rarámuri shamans use the plant in their curing rites or to help raise the soul of the deceased towards heaven.